Our recent San Diego corporate video production team webcast for HP’s printing division was a big hit not only for its content but also for its technical achievement. Thanks to a Teradek Cube, an amazing device the size of a deck of cards, Solana Productions was able to deliver the 90-minute show to thousands of HP staffers worldwide. 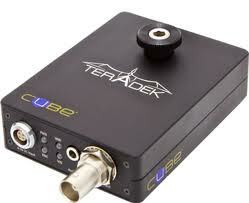 The device does the job of a satellite truck, streaming audio and video along the ethernet with absolutely no errors. We transmitted our live program to a Teradek decoder at HP in Palo Alto. From there, HP distributes the show to its employees all over the world. Solana Productions has been doing these kinds of San Diego video productions for more than 10 years with great success. Depending on the complexity of the staging, they can be set up in just a few hours. For this show, we installed all staging, lighting, projection, the TriCaster 8000 broadcast system and a sophisticated audio package. Solana Productions’ San Diego corporate video production team has more than 15 years of experience producing, shooting and editing projects for high-profile TV shows and corporate clients. With 14 EMMY Awards, a Gracie Award and many other accolades, our team brings high standards and professional expertise to every San Diego video production.